Gregory Horror Show is - or more accurately, was - one of the oddest shows on Japanese television; a medium known well for its love of the odd. An incredibly adult anime series, episodes of the show were aired on late night TV in Japan, and the series developed a powerful cult following for its very dark humour, inspired characters, and surrealistic design. Then Capcom, in the middle of a real purple patch of creativity through the PlayStation 2 era, decided to make a game based on the show. Far from being a throwaway licensed game, however, Gregory Horror Show on PlayStation 2 turned out to be a masterpiece in its own right, and a game that, to this day, remains one of the most memorable games that I’ve ever played. “Memorable” doesn’t mean perfect, but back in the day, when I was still figuring out exactly what kinds of games I liked to play (and still relatively ignorant about Japan), boy did this game capture my attention in a way that I would only realise, some years later, was because this is the kind of thematic intelligence that I really like seeing in games. 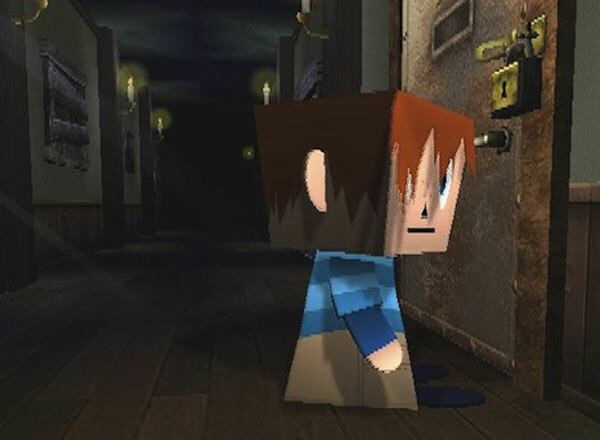 Gregory Horror Show, the game, was released in 2003, when I was 20 (yeah, I know, figure out my age if you want). I was in my second year of university undergraduate degree, then, which was in the arts, and I was just starting to learn about the philosophies of Foucault, Nietzsche, Sartre and others, which would later inform much of my understanding about games. To a person of that age and at that point in his intellectual development, Gregory Horror Show was something special. It was weird, but it was an organised kind of weird; everything in the game (and anime) had a point. It was difficult to understand, because I didn’t have a great grasp on the absurdism, moral theory, and otherwise that the game expressed, but there was a tantalising logic to it all that made me want to dig into it. Gregory Horror Show itself was darkly funny, and matched my sense of humour, too. Essentially, the game felt like it was designed for people like me, and I devoured it in kind. There were so many elements to the game as well, and it stood out as something unique and special from gameplay that it offered, too. You were an unwilling resident in a purgatory-like hotel, and the only escape was to collect the “souls” of the other residents and deliver them to death, a fun fellow that for some reason wore had that had a Swedish flag pattern on it. To collect the souls you had to stalk the residents around through the day, and come to understand their movement patterns, and their weaknesses. And then you needed to exploit that weakness in order to collect the soul. The problem was that the guests would chase you around once they’d lost their soul. So, at first while playing the game was a simple matter of tripping one guest and running off, after a while you also needed to carefully sneak around the hotel, so that none of the guests would find you. Because the guests were such fundamentally interesting characters - the lizard nurse with the massive syringe to this day terrifies me - there was never a dull moment in Gregory Horror Show, and though it became incredibly difficult, to the point where you would feel like you couldn’t travel anywhere without running into a crazed hotel guest, it was also a very difficult game to put down. A compilation of the game's "horror shows"
As I said at the start, Capcom was going through a real purple patch of creativity through the PlayStation 2 era, and it was one of my favourite developers. Games as varied as Chaos Legion, Clock Tower 3, Gregory Horror Show, P.N.03, Haunting Ground and Onimusha were hitting the market; some were commercial failures, others have become beloved classics. It’s a stark contrast to the Capcom of today, which relies heavily on a few blockbuster releases (Resident Evil and Monster Hunter), and is less ambitious about hunting down that big new franchise. These things come and go in cycles, of course. At the moment it’s Koei Tecmo that is lighting the Japanese games industry up with new IPs such as Toukiden and Nioh. Capcom’s creative streak will rise again, one hopes, but in the meantime, Gregory Horror Show was, for my mind, Capcom at its absolute best; taking risk and producing something very, very different. This is one of those games that fully sold me on the idea that games have equal artistic merit to other art forms, and I do wish that it was more readily available today, because it’s a game that would hold up remarkably well, as it still offers a lot that just hasn’t been attempted again.